Steamboat Gift Cards are issued by the Steamboat Chamber Resort Association and are redeemable at over 300 local merchants. This includes many vacation recreation and activity providers, retail stores downtown and on the mountain, spas and hot springs, as well as restaurants or even the grocery stores. These gift cards can be used like cash at almost any business in town. The value of your Steamboat Gift Cards is based on the cost of your lodging total, excluding taxes, according to the following table. 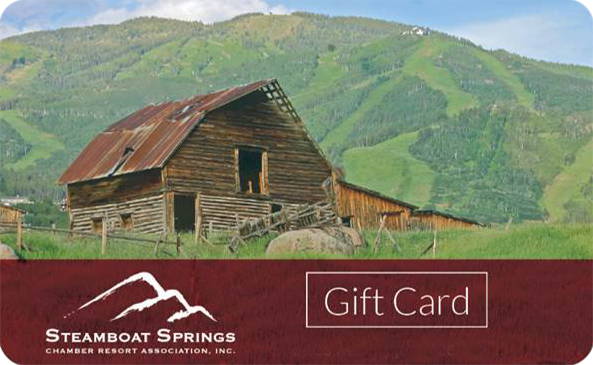 Whether you book online or over the phone your Steamboat Gift Cards will be available upon check-in. Click here to review or search the Steamboat Chamber Resort Association's business directory. Welcome to Steamboat Springs and Mountain Resorts. We are one of the largest and oldest property management companies in Steamboat Springs. We are Steamboat's Lodging Expert, with over 350 condominiums to offer you. Our goal is to help make your vacation with us a truly memorable experience by exceeding your expectations in accommodation and service. Our condominiums range in size from cozy, economical studios to luxurious four bedroom, four bath units all located at or near the ski area base.